Want to help support Transformations Wellness Center. Here's how! Help support TWC's treatment program for those in need. Call to make a donation today. You are now able to link your Rewards Card to Transformations Wellness Center by following the link below. 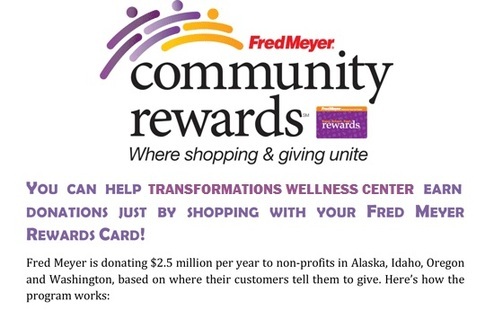 Whenever you use your Rewards Card when shopping at Freddy’s, you will be helping us earn a donation from Fred Meyer. If you do not have a Rewards Card, you can sign up for one at the Customer Service Desk of any Fred Meyer store. The Klamath-Lake Counties Food Bank has been serving our community for 31 years. In the tough economy people rely more on the Food Bank, which has helped nearly 6,400 households in the last 12 months. The Food Bank currently provides services throughout an 18,000 sq. mile area of Klamath and Lake Counties in Oregon as well as neighboring communities in California. Please visit the Klamath-Lake Counties Food Bank website for more information about how you can help.